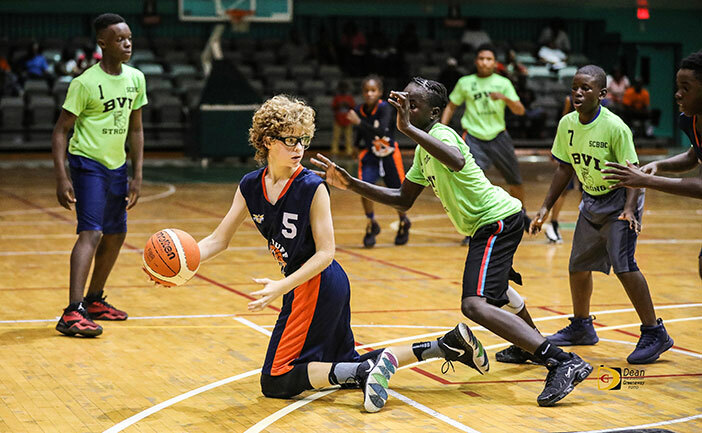 The Multipurpose Sports Complex came alive over the weekend, when the Sea Cows Bay Basketball Club launched its 9-12 and 13-15 Showtime in Paradise Basketball Tournament as part of its 25thanniversary activities, featuring teams from St. Thomas and Tortola. Led by Vincent Frett Jr.’s 17 points and six rebounds, Nuff Respect began play with a 36-15 victory over their St. Thomas counterpart Zero Tolerance on Friday night, while BVI Strong overpowered Tola Ballers, 31-11. On Saturday, Zero Tolerance turned back Tola Ballers, 26-6, while Frett had 10 points, five steals and three rebounds in helping Nuff Respect roll past turnover prone BVI Strong, 28-4. Calendar said he saw lots of potential in the BVI players and encouraged them to practice, practice, practice. McLean, who founded SCBBC on April 1, 1994, said he thought the tournament was very exciting and would have liked to see more fans coming out and supporting the BVI teams. McLean said when he looked at the talent levels, he recognized that in order to improve the talent level in the BVI, they must train and practice and they must be on top of their game. He said the players who represented the BVI were thrown together and they didn’t have solid practices. Among awards doled out, Nuff Respect’s Vern Frett Jr. scored the most points, had the most rebounds and was named tournament MVP. Zero Tolerance’s Kareem Pinnoy and the BVI’ Strong’s D’jahniah Pembertom, were the tournament’s Most Exciting Players. Milton McLean will lead a team to the CNBA South King Basketball Classic in Orlando, Florida,April 4-11.